A Junk-Foodaholic's Journey to a Healthy Lifestyle: Mmm Mmm Good? I'm not much of a commercial watcher but this one I like. Have you seen them? They feature a blindfolded woman as she taste-tests two soups. When she tastes the competitor's soup, she says she tastes sodium-something-something and MSG. Then she tastes Campbell's Select Harvest soup and says it tastes like 100% natural white meat chicken and spinach grown on a south-facing slope. (In another commercial, she tastes carrots from a particular farm and natural, lower-sodium sea salt from northern waters.) She's a good actress, because she makes it look like that soup is Mmm Mmm Good! Did you know that most canned soups contain MSG? You can be sure the FDA is not looking out for our health because MSG is bad news. Well, when I saw the commercials about Campbell's Select Harvest and heard there is no MSG or artificial flavors, I got excited. To be honest, I'm not a fan of canned soups and prefer instead to make my own. But canned soup is convenient and my fifteen year old (bottomless-pit) son is a soup-lover. He has consumed lots of MSG unknowingly and yes, his mom is to blame. 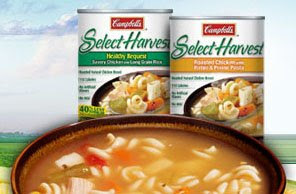 I'm excited to see Campbell's offering healthier soups. Have you tried it yet? If so, let me know your favorites. The USDA says MSG is Safe, But is it Healthy? I know a woman who is allergic to MSG. It causes all kinds of awful things for her and it's really, really hard to avoid entirely. We eat a lot of homemade soup. It's easy. I just throw everything in the slow cooker. All the veggies that are good in soup, like carrots and celery and onions, are cheap too. Haven't tried it yet, but I love soups and casseroles when it's Fall and winter, so I probably will try it pretty soon. Those soups are fine. They suffer from the same "tinned soup" taste that all of them have, but they aren't bad. Marilyn - I agree. It's unbelievable the number of foods that have MSG. Like you, I love homemade soup - tortilla soup and potato soup are my favorites. 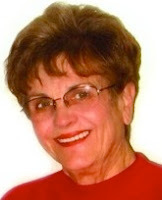 Irene - I love soups year-round but especially in the fall and winter. I'm going to try a can of Campbell's Select Harvest just to satisfy my curiosity.